One of the main scientific justifications for building Hubble was to measure the size and age of the Universe and test theories about its origin. Images of faint galaxies give 'fossil' clues as to how the Universe looked in the remote past and how it may have evolved with time. The Deep Fields gave astronomers the first really clear look back to the time when galaxies were forming. 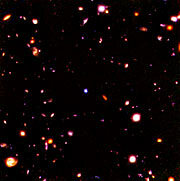 The first deep fields – Hubble Deep Field North and South – gave astronomers a peephole to the ancient Universe for the first time, and caused a real revolution in modern astronomy. Deep field observations are long-lasting observations of a particular region of the sky intended to reveal faint objects by collecting the light from them for an appropriately long time. The 'deeper' the observation is (i.e. longer exposure time), the fainter are the objects that become visible on the images. Astronomical objects can either look faint because their natural brightness is low, or because of their distance. In the case of the Hubble Deep and Ultra Deep Fields, it is the extreme distances involved which make them faint, and hence make observations challenging. 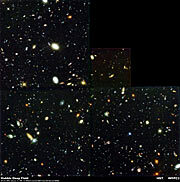 The idea for the Hubble Deep Fields originated in results from the first deep images taken after the repair in 1993. These images showed many galaxies, which were often quite unlike those we see in the local Universe and could not otherwise be studied using conventional ground-based telescopes. 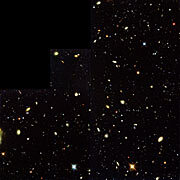 The first Deep Field, the Hubble Deep Field North (HDF-N), was observed over 10 consecutive days during Christmas 1995. The resulting image consisted of 342 separate exposures, with a total exposure time of more than 100 hours, compared with typical Hubble exposures of a few hours. The observed region of sky in Ursa Major was carefully selected to be as empty as possible so that Hubble would look far beyond the stars of our own Milky Way and out past nearby galaxies. The results were astonishing! Almost 3000 galaxies were seen in the image. Scientists analysed the image statistically and found that the HDF had seen back to the very young Universe where the bulk of the galaxies had not, as yet, had time to form stars. Or, as the popular press dramatically reported, “Hubble sees back to Big Bang”. These very remote galaxies also seemed to be smaller and more irregular than those nearer to us. This was taken as a clear indication that galaxies form by gravitational coalescence of smaller parts. In 1996 it was decided to observe a second Deep Field, the Hubble Deep Field South (HDF-S), to assess whether the HDF-N was indeed a special area and thus not representative of the Universe as a whole. This time the field also contained a quasar, which was used as a cosmological lighthouse and provided valuable information about the matter between the quasar and the Earth. "In my view the Hubble Deep Fields are some of the images that have made the greatest impact on observational cosmology so far. These impressive dips into the depths of space and time have allowed astronomers to glimpse the first steps of galaxy formation more than 10 billion years ago and are without doubt some of the great legacies of the Hubble Space Telescope." After the Hubble observations of HDF-N and -S, other ground and space-based instruments targeted the same patches of sky for long periods. Some of the most interesting results seem to emerge from these fruitful synergies between instruments of different sizes, in different environments and with sensitivity to different wavelengths. The Hubble Ultra Deep Field from 2004 represents the deepest portrait of the visible universe ever achieved by humankind. Using the improved capabilities of the Advanced Camera for Surveys, the camera installed during the 2002 servicing mission, a new Deep Field was observed, in the constellation of Fornax (the Furnace). It reveals some of the first galaxies to emerge from the "dark ages", the time shortly after the Big Bang when the first stars reheated the cold, dim universe. The Ultra Deep Fields show the furthest away galaxies that can be observed in visible light. Because the Universe expands, light waves from very distant objects is stretched during its long journey to us. The further away objects are from us, the more their light is stretched. As longer wavelengths appear redder than shorter wavelengths, this phenomenon is known as “redshift”, and it is somewhat similar to the Doppler effect heard when an ambulance siren drops in pitch as the vehicle speeds away. For very distant objects, their light is shifted so far that they drop out of the visible spectrum altogether, and can only be seen in infrared light. This means that the Hubble Ultra Deep Field cannot be improved on by building a more sensitive optical telescope — Hubble has reached the limit of what is possible in visible light. 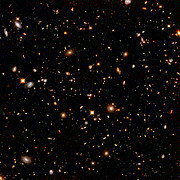 The Hubble Ultra Deep Field, imaged in 2004 by the Advanced Camera for Surveys. This is the deepest visible light image ever made of the Universe. The only way to see further is to look in infrared. The only way to see further than the Hubble Ultra Deep Field is to look beyond the optical wavelengths and observe in infrared instead. The Hubble Deep Field imaged in infrared. The Hubble Deep Field South imaged in infrared. 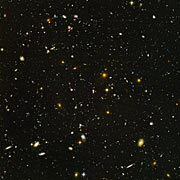 Hubble’s 2004 infrared image of the Ultra Deep Field. Using NICMOS, its first near infrared camera, Hubble made infrared observations of the original Hubble Deep Field, the Hubble Deep Field South and Hubble Ultra Deep Field. These images revealed more distant objects, though the picture quality achieved by this instrument could not compete with optical images. The next breakthrough came after the 2009 servicing mission in which astronauts installed a new instrument capable of making greatly improved infrared observations. 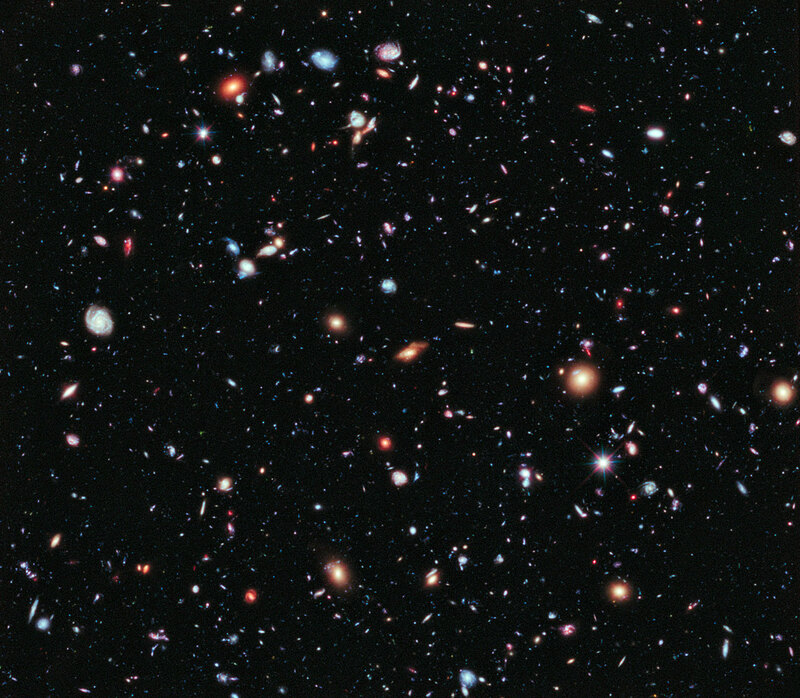 The resulting image, covering most of the field of view of the 2004 Ultra Deep Field observations, is the deepest ever made of the cosmos. It is unlikely to be surpassed until the NASA/ESA/CSA James Webb Space Telescope is operational, later this decade. 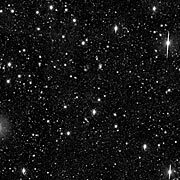 The 2009 infrared image of the Hubble Ultra Deep Field has been an extremely fertile hunting ground for scientists who study the early Universe. Several candidates for the most distant galaxy ever observed have been spotted in this image. The last Hubble Ultra Deep Field released in 2014 was observed in ultraviolet. This image allowed astronomers to study star formation in a region 5 to 10 billion light-years away from us. 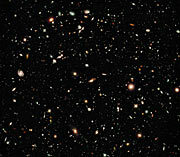 The study is called the Ultraviolet Coverage of the Hubble Ultra Deep Field (UVUDF) project. The addition of ultraviolet data to the Hubble Ultra Deep Field using Hubble's Wide Field Camera 3 gives astronomers access to direct observations of regions of unobscured star formation and may help to fully understand how stars formed. 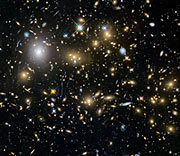 The Hubble Frontier Fields is a three-year, 840-orbit programme which created the deepest views of the Universe to date, combining the power of Hubble with the gravitational amplification of light around six different galaxy clusters to explore more distant regions of space than could otherwise be seen. These observations are helping astronomers understand how stars and galaxies emerged out of the dark ages of the Universe, when space was dark, opaque, and filled with hydrogen. In analysing how the light of more distant galaxies is bent by the cluster astronomers also learn about the distribution of normal matter and dark matter within such clusters. While one eye of Hubble was observing its main target, the massive galaxy clusters, the second eye — another instrument — was looking at a part of the sky right next to the cluster. These are called the Parallel Fields. Although not as spectacular as the light-bending clusters, these parallel fields are as deep as the main images and can even compete with the famous Hubble Deep Field as regards depth. They are therefore a valuable tool for studying the evolution of galaxies from the early epochs of the Universe until today. The observations for the Frontier Fields campaign were completed in 2017. The analysis of the data led to many discovery. Including some of the most distant known galaxies so far and the observation of a lensed supernova. The galaxy cluster MACSJ0717.5+3745 was one of the six targets of the Frontier Fields project. Images of the the Hubble Deep Fields. Video background to the Hubble Ultra Deep Field. Hubblecast episode 08: A step closer to our origin. Hubblecast episode 40: Wide Field Camera 3. This episode discusses the new infrared camera which made the 2009 observations possible.